We’re directly interested in finding out more about the pains and gains of the blogging universe. One gal who has an in‐depth knowledge is Sheila — a professional blogger who pivoted both her blog and business. The shift helps her develop a stand‐alone coaching business. The first time I came across Sheila’s blog was more than six months ago. I was delving into the blogging world searching for the A‐players out there. I wanted to learn more about their approach on blogging, how they nurture their community, and how they make money out of their passion. What stood out was that Sheila has such a strong reputation. After stalking her for weeks in a row, I found out why: she’s authentic and consistent. 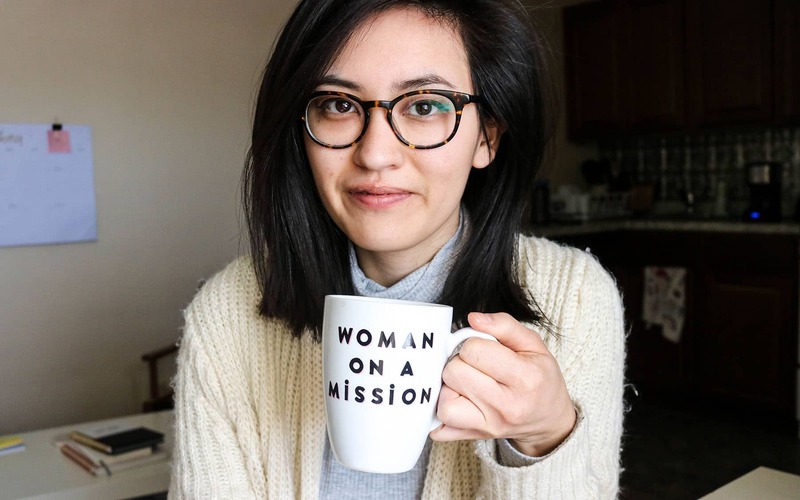 She twisted her blog and business — from blogger to entrepreneur who’s helping new and aspiring women start their own creative coaching businesses. I took her an interview to find out more about how it feels to go to the next level, but also to find out how are things looking from her side of the world. Let’s dive in! Q: Who’s Sheila on and off the record? Sheila: Hey there! First of all I want to thank Pixelgrade for giving me the opportunity to share my story and I want to thank YOU for reading it! I grew up and currently live in Pennsylvania, which I will always call home. I currently work as a full‐time archivist and book cataloger in a library and am also an Intuitive Business Coach where I help creative high‐vibe women start the coaching business of their dreams. My passion lies in helping people and I truly believe that is what I was called to do. I spent over four years trying to grow as a fashion blogger so I could be like the other “big bloggers” who landed cool sponsorships and traveled the world. I’m also really into manifesting and the Law of Attraction, yoga, journaling and Game of Thrones. One of my big dreams is to travel the world, which my blog and business is going to help me do! Q: Where does this passion for digital come from? Sheila: I’ve always considered myself a creative person. When I was a kid I loved drawing and even had a comic book series with one of my friends in 5th grade (which was a big hit with our classmates!) When I got to high school I fell in love with photography and created my first “blog.” Nowadays I love that I can connect with so many inspiring people across the world all thanks to the Internet. Q: You kicked‐off as a fashion blogger. Why did you drop it? Sheila: When I started blogging my intention was to shared my photography online. In 2013 it morphed into a fashion blog because I loved shooting self‐portraits and also got more into fashion and personal style. I spent over four years trying to grow as a fashion blogger so I could be like the other “big bloggers” who landed cool sponsorships and traveled the world. I quickly realized it was really hard to grow and my passion for it disappeared. So my biggest tips for growing your blog is to know who you help, build a community, and become an authority figure in your niche. In early 2017 I experienced a negative situation at my 9–5 that made me realize I wanted to become an entrepreneur, so I switched gears and quit being a fashion blogger. 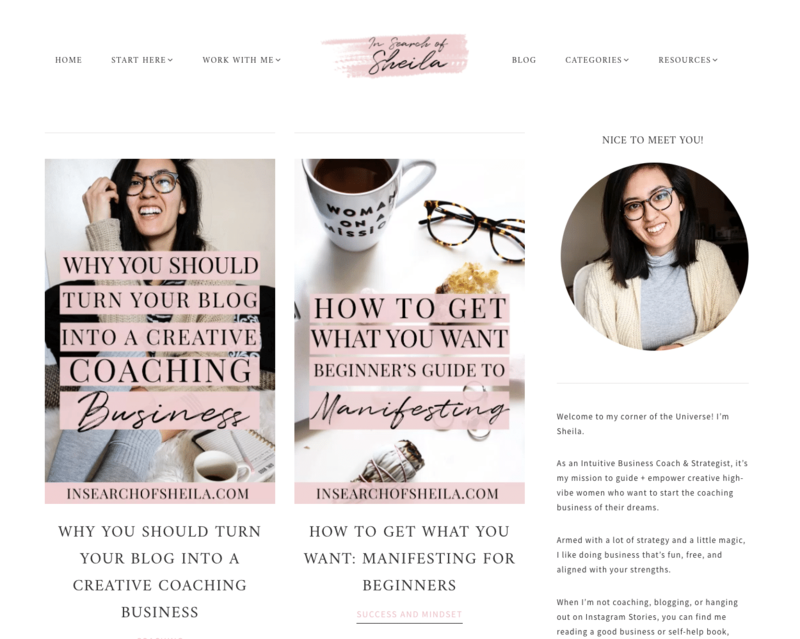 I rebranded and became a go‐to resource for beginner bloggers who wanted intentional and authentic strategies to grow their blogs. I also created a positive community through my brand to connect with other like minded bloggers. Q: You’re well known as a top‐notch blogger. What helped you build the reputation? Sheila: Well thank you for the compliment! When I rebranded in mid‐2017 I mapped out my vision for my blog and business, which I think was the key to my success. I knew who I wanted to help and how I was going to help them. I also knew I was going to use my blog to help me create my own coaching business. I visualized it all and it happened. I was focused and made some sacrifices. It was all worth it. I truly believe everything happens for a reason and I had to struggle growing my blog for years before I found my true calling. From a more practical and strategic standpoint, Pinterest was a game‐changer for traffic. And then building relationships with my audience helped me grow my know‐how and trust factor for sure. So my biggest tips for growing your blog is to know who you help, build a community, and become an authority figure in your niche. Q: How would you describe your path as a blogger? Sheila: A game of trial and error! I was a fashion and then lifestyle blogger for over four years and when I lost my passion for it, I rerouted to help bloggers and aspiring entrepreneurs. But I had to spend that time writing about different topics to figure out what I was passionate about and of course, my interests changed over time! Every blogger and entrepreneur has their own unique journey, which means not every strategy or approach will work for them. That’s kind of where the name In Search of Sheila comes from…I wanted a name and brand that could evolve as I evolved as a person. Q: What would you make different if you had the chance? Sheila Honestly, I’m not one to hold regrets. I truly believe everything happens for a reason and I had to struggle growing my blog for years before I found my true calling. But since I struggle with time management, I would probably change how much time I’ve wasted on certain tasks, such as mindlessly scrolling on social media! Q: How did you capture this business need aka coaching? Sheila: It stemmed from my passion for helping people and blogging. When I figured out how to blend them into a profitable business model, coaching made perfect sense. Every blogger and entrepreneur has their own unique journey, which means not every strategy or approach will work for them. I recognized a gap for this in the industry — seems like every entrepreneur has a “signature method” but what about the people who needed something more customized and tailored to them? And that’s why I love coaching women because I can help them create their own growth strategies from a place of alignment. Q: Is there a right moment to take the leap? Sheila: One thing a lot of my readers tell me is that they’re scared to start their blog, usually because they want it to be “perfect” or they don’t know what to write about. I tell them that fear will always hold you back and you just gotta do the damn thing! And as far as not knowing what to write about, that’s why you need to just start writing so you can find what you’re passionate about. So the right moment to take the leap is now. Let’s create a blog that people love and remember. We help you express your ideas in style. Q: How does your current blog sustain your business goals? Q: What gives you drive to help people make money out of their passion? Sheila: My passion for helping people profit from their passion stems from my abundance mindset. There is plenty of success and money to go around for everyone so there is no need for competition. When you think that success is limited — meaning you have a scarcity mindset — you end up sabotaging your own success. When you act from a mindset of abundance, success is inevitable. Q: You’re giving back (the Coaching Business Masterclass is an example). Why’s that? Sheila: When I rerouted my journey and committed to making it a business, one of the biggest things I learned is to always give away lots and lots of value…for free. There is definitely a line to draw between free and paid content, but when you’re starting out and trying to grow your audience, giving away lots of value for free is how you build your trust. Free value is a great way to invite people into your world and show them what you really have to offer! I kindly asked Sheila to record a video message and answer to the following question: What would be the one message you’d like to share for all the fellow bloggers out there? Here are her two cents on this one. You are free to create your own path, but as Sheila recommends: now it’s the best moment to jump into the water. We can help you by offering you top‐notch WordPress themes, a set of valuable tools to create a beautiful blog, and an onboarding experience that most people love and remember. Ready?